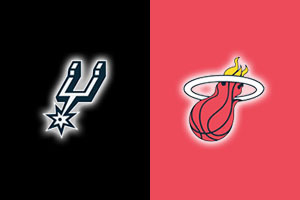 The teams for the 2014 NBA Finals have been decided and Miami Heat and San Antonio Spurs will be the two teams battling it out for the biggest prize in basketball. Both teams clinched a 4-2 series win to dispose of the Indianapolis Pacers and Oklahoma City Thunder respectively. Trailing 3-1 coming into the fifth game, the Pacers knew they had to win at home to have any chance. It was a topsy turvy game, with a number of big quarter victories for either side but in the end, the Pacers held on to make the score 3-2 in favour of the Heat. 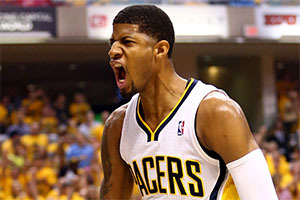 Paul George was the big player in the game with a total of 33 points. There was a big moment in the game with an instant replay review going in the favour of the Pacers. Indiana’s lead had been cut to 91-90 with 16 seconds on the clock when Shane Battier deflected an inbound pass to George out of bounds. The ball was initially awarded to Indiana before an agonising review of the play took place for a number of minutes. When the officials finally confirmed the call, the Pacers fans breathed a sigh of relief and the team strode on to see out the game at 93-90. Knowing that a home win would see the team through to their fourth straight season was all the incentive Heat needed to power home. This was the first time an Eastern Conference team managed this since the Boston Celtics run from 1984 to 1987. For the third game in a row, Chris Bosh delivered more than 20 points with him and LeBron James scoring 25 points each. Paul George was the top scorer in the game with 29 points but this achievement will matter little as the Heat look forward to the NBA Finals. This was the third season in a row where Miami had taken care of the Pacers in the Play-Off stages. Trailing 2-0 going into their first home tie in the NBA Western, the Thunder brought the tie back to 2-1 and they were determined to level the tie before they were heading out on the road again. The fourth game in the series took place on the 27th of May and Oklahoma raced out of the blocks in the first half. While it is often the points clinched at the end of the game that seals a basketball match, in this game, the Thunder took an early lead and had built up enough of a gap to protect themselves from the Spurs come-back. A 26-20 first quarter lead was followed up by a 32-23 triumph in the second quarter, seeing the Olkahoma City Thunder holding a 15 point lead at half-time. 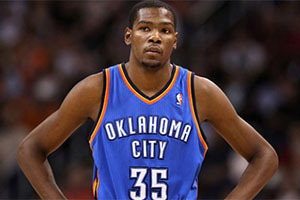 This was lifted to 16 points by the end of the third quarter with the Thunder clinching a tighter quarter 25-24. The Spurs scored more points in the final quarter but a 22-25 margin was nowhere enough to narrow the deficit, with the score finishing at 105-92 to the City Thunder. The undoubted star of the show was Russell Westbrook who scores a phenomenal 40 points and 10 assists. Westbrook also grabbed 5 steals in this match, giving him a career play-off high on a stunning night for the player. Westbrook was 12 for 24 (which includes 14 points from 14 at the free throw line), and he also grabbed 5 rebounds. Kevin Durant delivered 31 points so these two players combined to serve up a 71 point combination between them. An interesting point was that even though Spurs were mounting a comeback in the latter half of the game, the star players remained on the bench. This was a must-win game for Oklahoma and the Spurs coach Gregg Popovich clearly felt that keeping his players fresh for Game 5 was the most important aspect. Home comforts once again came to the fore in Game 5 of the series as San Antonio Spurs took a 3-2 lead in the series on the 29th of May. The scores for both teams may have been higher but there was not the same level of individual brilliance or high performance that marked game 4 in the Play-Offs. The leading scorer in the game was actually on the losing side, with Kevin Durant picking up 25 points. The top shooter for the Spurs was Tim Duncan who grabbed 22 points to go alongside 12 rebounds. The first quarter was a tight yet exciting affair with the game level at 32-32 but Spurs managed to open up a lead at halt-time with a 33-23 score in the second quarter. This gave the Spurs a 10 point advantage at half-time and the team would outscore their opponents in both quarters of the second half. A 29-19 and 23-15 return indicated that the Spurs were right to keep their best players in reserve for Game 5 as they ran out convincing winners in the end. The Spurs knew that they were within one game of heading to the NBA Final and even if they were to lose out in Oklahoma, they would have a final home game to book their spot. Up to this point, home advantage had been very telling in the Western Conference so few people were betting against the Spurs. However, the Spurs ripped up the trend as they clinched the series 4-2 after a thrilling OT victory in Oklahoma. The Thunder clinched the first two quarters, 32-20 and 26-22 but a massive third quarter performance saw a 37-20 score line open up a 10 point lead for the away team. Knowing that it was now or never, the Thunder sprang back into life, roared on by the crowd at the Chesapeake Energy Arena. With ten seconds left of the tie, Spurs held a 2 point lead at 101-99 when Russell Westbrook was given the chance to level it off with two free throws. This was a huge level of pressure on the player, knowing that he had to score to keep his team in the contest. Westbrook succeeded and there was a huge sense of energy in the Energy Arena with a 32-22 final quarter score line levelling the score at 101-101. The sense that the Thunder had given it their all to stay in the tie was evident as Spurs withheld a difficult start of OT to eventually create a gap that saw them clinch a 4-2. The first game in the NBA Final takes place on Thursday the 5th of June in Texas and bwin believe that home advantage sees the Spurs as favourites for the game. You will be able to get odds of 1.55 on San Antonio while the Heat are listed as 2.50. The pricing is listed on bwin for the first four games in the NBA Finals and at the moment, bwin is backing all of the home teams to triumph. If it pans out the way that bwin sees it occurring, we’ll be tied at 2 games each with three fascinating games left. The site is also offering up a range of team specials, player specials, handicaps, scoring by quarters, fouls, rebounds and plenty more aspects. If you are looking to be involved with every minute and play in the NBA 2014 Finals, basketball betting with bwin looks your best bet.